Summertime in Chicago is fleeting which is why locals make the most of it. 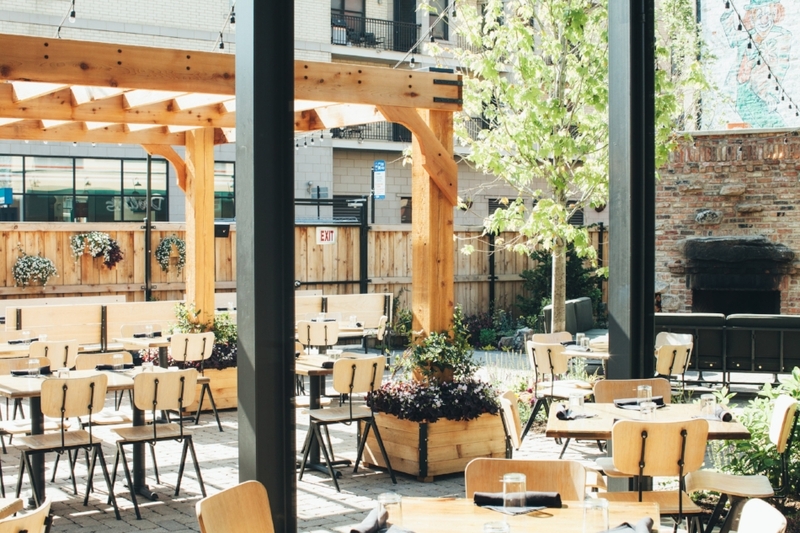 Now that it’s August, it’s time to soak in the remaining weeks of patio season. While most patios will stay open through September and maybe even October, this is more than likely the last full month of summer weather. Chicagoans will gather their tribe and head to their favorite spots to enjoy the hot sunny rays while sipping a cold cocktail or glass of wine. They’ll talk about any late summer trips they’ve planned and reminisce on all the shenanigans that have happened the last few months from festival memories to bad blind dates. As much as I really don’t enjoy the heat, it’s my favorite part of summer because you have this renewed energy to take advantage of things like patios and outdoor concerts. You want to wear all those cute summer dresses you’ve been accumulating before it’s time to break out the chunky, oversized sweaters. The entire city of Chicago has an energized spirit that is hard to ignore. Whether you’re a local looking for a new spot or a visitor in town for a few days, I’ve put together a list of 8 restaurants with patios to take advantage of in these final days of summer. For great Italian, head to Bar Siena. Chef Fabio Viviani created a dynamic space inside and out with this restaurant. Located on Randolph Street along Restaurant Row, the menu is inspired by Italian street food like pizzas and shared plates. It’s strongly recommended (by yours truly) to share because you get to try a little bit of everything and believe me, you’ll want to. Bar Siena is open for brunch, lunch, and dinner but most important, they serve dessert from Bombobar. Bombobar is a walk-up window on the side of the restaurant serving delightful bombolini, my kryptonite. Bombolini are Italian doughnuts, or more simply put, fried dough dredged in sugar. Stuff them with Nutella, seasonal jams, s’more flavors and more. As far as dinner is concerned, try the Burrata to start or the Taleggio Focaccia followed by a pizza and a pasta. The Sausage and Brussels Sprout Pizza is a nice change from tradition but the Fireball Pepperoni is like a grown-up version of your childhood favorite. The Short Rib Lasagna is out of this world and the Sweet Corn Ravioli is summer on a plate. You see why it’s important that you share plates now? The staff is very familiar with the drink menu and is able to provide great pairings for your dinner, even if your dinner is all over the place with flavor profiles. This Wicker Park coffee shop has one of the largest patios I’ve seen for a coffee shop. Caffe Streets is a great spot to enjoy a patio while you need to get work done. The coffee shop offers free wi-fi, bomb espresso and a welcoming environment. It’s an independently run business serving brews from Metric Coffee Co., another local Chicago business. The patio is out front along Division Street and bordered by rustic wood railings with planters for a touch of homeyness. Even though Division is a busy street for the area, it’s not as loud and distracting as you’d think. I will say, this is a popular spot among locals so if you want to grab a seat, make sure to get there early. They don’t have a huge menu but they do have a variety of sweet and savory bakery items. Since opening not too long ago, Cindy’s Rooftop has established itself as a staple for Chicago bucket lists. Locals love it and out of towners have to visit if only to see the amazing views. Located in the Chicago Athletic Hotel, Cindy’s has a rooftop terrace with some of the best views of the city. Overlooking Millennium Park, get sweeping views of Lake Michigan, Michigan Avenue and more. It’s a spot that I take family from out of town and also meet friends for a drink. The outdoor terrace has fire pits to keep warm when the nights are cool and as fall creeps in. The doors to the terrace open wide to bring the outside in on a beautiful, sunny day. Cindy’s is known for having an innovative craft cocktail menu and iconic brunch. Part of the reason you visit Cindy’s is to take a picture of your gorgeous cocktail with the view of the city in the background. If you head to Cindy’s for brunch, the Spiced Cinnamon Roll is worth getting sticky fingers for and the Avocado Toast is an elevated version of the popular dish. I’d get into the cocktails and drinks but there are so many options for every palate that we’d be here for days. If you’re like me and read a wine list better than a cocktail list, don’t be afraid to ask your server or the bartender for a recommendation. The whole point of craft cocktails is to provide a unique experience that you enjoy. Tell them what you like, what you don’t like and they’ll point you in the right direction. For an ultimate patio experience, walk down the riverwalk and there is no shortage of spots to grab a seat. The riverwalk location is an extension of the larger City Winery on Randolph Street in the West Loop. The riverwalk is a newer development in the downtown area of Chicago. It used to be a place to avoid but now has a beautiful path on the south side of the river featuring restaurants, vendors, and activities like boat cruises and kayaking. City Winery offers wine on tap and by the bottle. The menu features shared plates, tours, charcuterie and cheese boards, paninis and more. On a hot day, I love to share the Schmear Plate with a friend or the Artisanal Cheese “Tour.” The Grilled Cheese is a stand-out sandwich for something more hearty featuring house-made apple butter and sun-dried tomato. Just trust me on this one. Walking into Ema, it feels like you’ve entered Los Angeles. I’ve never been to the California mecca but I imagine that Ema is what LA restaurants feel like. It makes sense considering Chef CJ Jacobson is an Orange County native. He’s brought a taste of home to Chicago with Mediterranean-style cuisine using a California twist. Open for brunch, lunch and dinner, Ema serves food that tastes great and makes you feel even better. Even though Ema is in a busier part of River North, the patio offers a little seclusion and separation from the rush of traffic. It’s the perfect way to enjoy a late summer day and escape the hustle and bustle of everyday life. Plates are meant to be shared but that’s always ok with me as long as I get to try a number of dishes. Start off with one of their many spreads served with house made bread. The Garlic Hummus is a dream and the Avocado & Sweet Pea is a treat using the best ingredients of the season. A few other recommendations are the Sweet Corn Risotto, Grilled Pork Belly and Green Falafel. Enjoy plates both cold and warm, vegetarian and meaty. There’s seafood, kebabs, grains, and their famous Rotisserie Chicken that’s also available at the quick counter to-go. Another California-inspired restaurant, Summer House Santa Monica, won me over as soon as I experienced the clear ceiling that opens on dry days and lets all the sunshine in. This is another California-inspired menu with a focus on local, seasonal ingredients...my favorite! It’s an Instagram dream with all the natural lighting and bright, neutral colors. The food is amazing as well. From sushi to pasta to grilled proteins, even the pickiest of eaters will find something to eat at SHSM. The Ahi Tuna and Watermelon Tostada is fresh and flavorful while the Beyond Bolognese is a “meaty,” plant-based version of my favorite pasta. The restaurant is also known for a fantastic brunch which I have yet to experience but it remains on my bucket list! Don’t leave without dessert! Summer House Santa Monica shares a bakery with neighbor restaurant Stella Barra featuring fresh-baked cookies, pastries and more. Finish the night with something sweet and a little espresso. It sounds like heaven to me. The Dawson has been a particular favorite of mine since it opened back in 2013. I’ve come here on many occasions for everything from dinner with friends to dinner for business. It’s a sophisticated dining experience with an elevated menu and gorgeous space. One of the best parts of The Dawson is the enclosed outdoor patio. It feels exactly how a backyard should but more grown-up. Pergolas, light landscaping, and string lights provide an ambiance that’s suitable for dinner with friends or an intimate dinner for two. The Dawson’s menu doesn’t have to be shared but I always welcome any opportunity to try more than one dish. The Chorizo Fondue brings two of my favorite things together: cheese and chorizo. I’m not one to order fish but the Halibut with Zucchini and Harissa-Roasted Carrots is a dynamic summer dish. The House-Made Cavatelli with Pork Ragu is also sensational. One of The Dawson’s unique offerings is a selection of meals prepared over a wood-fired grill. It’s a traditional method of cooking and uses seasonal ingredients. The flavors are out of this world and the proteins cooked perfect. Final note for a side dish...order the Brussels Sprouts. You’ll never have them this good anywhere else. 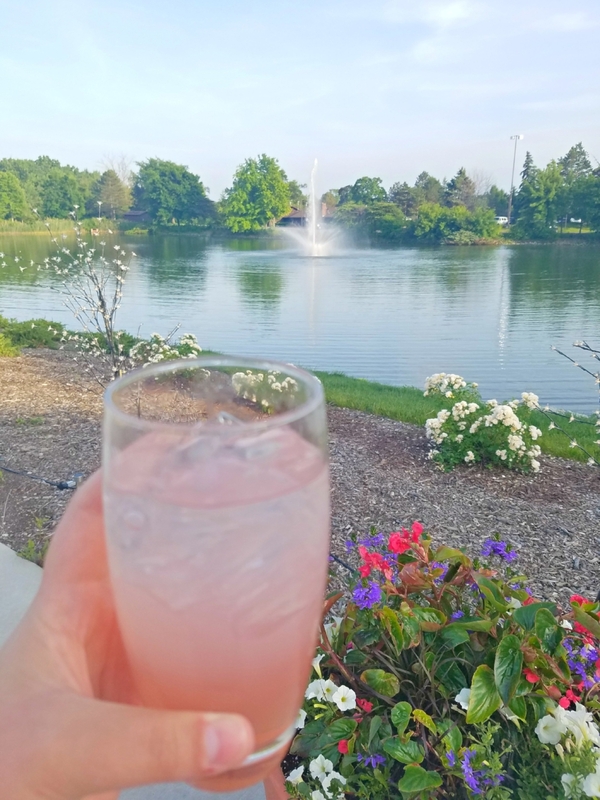 If you’re willing to make a trip out to the suburbs, plan a visit to Three Embers at the Chicago Marriott Lincolnshire Resort. I recently shared a full review of the restaurant but it deserves a place on this list as well. Serving up Midwest cuisine with locally grown and sourced, farm-fresh ingredients...the main reason Three Embers belongs on this list is the stunning Lakeside Plaza. More than a patio, this plaza has gorgeous views of the resort’s grounds including a small lake and fountain. With plenty of outdoor seating, gorgeous views, and live acoustic music, it’s one of the best patio experiences. I’d love to revisit in the fall because something tells me the changing colors in the trees will be even more breathtaking than they are now. If you have a chance to visit while they’re still serving the summer menu, I recommend going for the Honey Badger Glazed Pork Belly alone. The Blueberry Coconut Lemonade isn’t so bad either 😉.